She wants to save what's left of her family. He wants his dead. Both want to find peace. Prince Sageren, Son of Lothar has spent the last fifty years in exile, awaiting the day when he can finally avenge his family and take back his throne. Barely existing, he's forced to face his inner demons and the monster he once was, compelling him to vow to never drink from humans again. A simple enough task--until he crosses paths with a human who makes his fangs ache to drain her. Paranormal Romance Guild's 2014 award for Best Fantasy Series. *****5 Stars - Rebekah has a real talent for taking paranormal and the favorite fairytales and making something so much better! This is my favorite story so far. *****5 Stars - Rebekah's versions of the fairy tales we know and love are more captivating than the originals. *****5 Stars - I love this book so much I am rereading it again. i like it though not as much as book 1. But the conflict is good and the ending is great. Another win by author Rebekah Ganiere, in this her second book, from her Fairelle Series. Her stories are filled with great twist to the original fairytales. In this one we have Snow, sister to seven Vampire slaying brothers. They became slayers not by choice, but by some magic that required there be Seven and Snow want's desperately to become one herself. But her brothers will do everything to protect her from the life of killing these monsters. So she trains on her own in secret, and one day meets a stranger, Sage, at her secret location. She is somehow drawn to him and slowly begins to trust him and even lets him train her in the skills she'll need to fight and kill the dreaded vampires. But he has a secret that he knows will probably turn her away from him. He knows he has to tell her, but before he is able to tell her, a terrible tragedy occurs. One that changes Snow not only physically, but tears her apart emotionally, due to her feelings for Sage. That's it, I don't like spoilers so I hope I've given you just enough to draw you in. If your a fan of paranormal adventures, evil and good fighting it out, which also includes vampires, werewolves, magic, impossible love, all wrapped up in a magnificent story, then this book, and definitely the series is for you. Can anyone say 'Book Hangover'??? because that seems to be what I get when I read one of Rebekah's books... because it just happened to me again after reading book 2 of the "Fairelle" series. I recommend that you read book 1 'Red the Were Hunter' first, as you need to read the books in order to get the bigger picture for the book & the best for the overall series. The Prohphecies have started to come true in Fairelle! 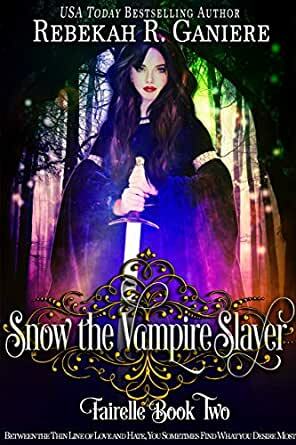 I LOVED Snow's story, from the moment I started I was drawn into Snow's life, living with her seven brothers who are still trying to get used to being Slayers. Secretly training herself because she is a girl, her brothers are over protective, they don't want to loose Snow, family is very important to them all. Escaping every night to practice her swordswomanship (I went back to change that from swordsmanship), Sage & Snow meet, Sage doesn't want to return but something about Snow draws him to her. Sage is the exhiled Vampire prince, wanting vengeance on his uncle for killing his father & younger brother. Again not all is what it seems in this book, we have surprises, secrets, lies, betrayals, loads of action, love & inner growth. I especially like how we have characters from book 1 come into the scenes in book 2, it was great to be told how things were going with Red & the pack. Bring on book 3, I can't wait to see how the next prophecy unfolds. Prince Sage lost his family and his kingdom to his treacherous uncle. But he is waiting for opportunity to gain his throne back and save his people. He knows, that the key lays in second Fairelle prophecy. Snow Gwynn is taking care of seven older brothers, since they became Vampire Slayers? But are the Vampires really the ultimate Evil, or is it something much worse? Deep in her heart she wishes for love and soulmate, but she allready gave up the hope because of the familly mission. But when she and Sage met one night, we have really wonderfull and fairytale like love story. I loved this authors take on Snow white and the seven dwarfs. This book was excitement with each turn of the page and you never knew what was going to happen. There is sadness and surprises around each corner. You will find yourself laughing and crying as you read along. You might even yell at the author as you read. You cannot help but fall in love with the characters in this book. You can just watch as Sage and Snow fall in love. You can feel that love just drip from the pages. You can't help but feel for Dax as he tries to remember his life, or for Snow's brothers and the changes that they have to go through. An amazing read. The story was well developed as was all the characters. Now I have to go back and read book 1. I was amazed at how easily ventured off into this world Rebekah created. I didn't realized it was based on Snow White until later, because it was so well written. You are definitely routing for Sage and Snow to have their HEA. I was sad about Flint. I want to find out, if possible in book one, or maybe the next book, what has caused him so much pain. I really do not have anything significantly negative to say about the story. There were some parts that dragged on in the beginning for me, when the foundation of the story was being mapped out, but they were very few. I highly recommend this story. Wow! 5.0 out of 5 starsMy favorite so far! Rebekah has a real talent for taking paranormal and the favorite fairytales and making something so much better! This is my favorite story so far (I love my vamps!). Snow is a strong, brave, stubborn, take charge kind of lady. With seven over protective brothers, the last thing she needs is another alpha male trying to protect her. But when she meets Sage, that's exactly what she gets. The only difference is she wants him and she's not going to let anyone or anything stand in her way! Sage only wants one thing - to regain control of his kingdom and revenge for the murder of his family. Just when he thinks he might be close, he discovers there is something or rather someone, he wants more. Snow is the one, his mate, but not only does he not have anything to offer, her brothers are Slayers. Determined to do what's best for her and keep her safe, he must give her up. But what happens when she's in danger? Can he form a truce with her brothers to save her, or will they kill him first?